Gunung Sirung (862 m) is one of the less visited volcanoes of Indonesia, but one of the most fascinating. It is the (second*) youngest and northernmost of a chain of volcanoes extending from the south-western tip of Pantar north-east to Beang Bay. The volcanic chain is about 14 kilometres long. Mt. Sirung is the only active volcano of the range. The latest minor eruptions occurred in 2012. 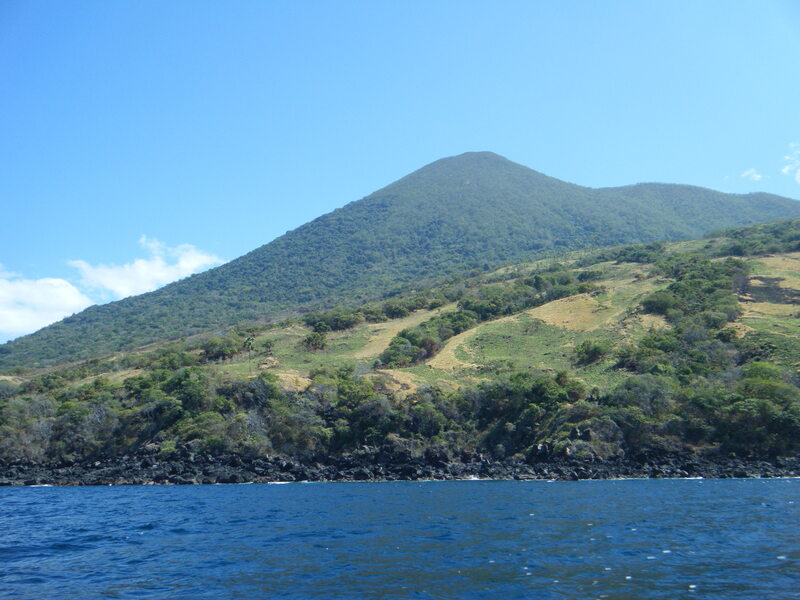 The other volcanoes are overgrown with vegetation, including the highest point. There seems to be some confusion over the name of the highest point. Sources state ‘Sopak’, ‘Topaki’ but most likely ‘Delaki’. Gunung Delaki, located south-west of Mt. Sirung, is somewhere between 1,336 and 1,372 metres high and is the highest mountain of the range and of Pantar Island. The hike from Beang up to the crater rim is an easy 4 or 6 hours’ walk-up (the time depends on the route), mostly through beautiful eucalypt savanna. From the crater rim to the top, it is another 2 to 3 hours’ climb in pathless terrain. From Beang, there are two routes to the crater of Mt. Sirung: one via Darang (Route 1), and one via Kakamauta (Route 2). Starting from Beang, take the trail heading south to the tiny village of Darang, where you will arrive in about 45 minutes. In Darang, the houses still have grass-thatched roofs. From Darang, a trail leads up the steep eastern slope of the volcano to the crater rim. Walking time is 3 hours. From where you arrive at the rim, you can head north-west, around the north-eastern side of the crater, to the canyon where the trail from Kaukamauta comes up. Starting from Beang, take the trail leading uphill to the village of Kakamauta. The trailhead is just behind the houses in the centre of Beang. The path will give you a stunning view of Beang Bay and take you through savanna woodland with lontar palms and eucalyptus trees. Shortly before you arrive at Kakamauta, you will pass small cashew plantations. From Beang to Kakamauta, it is a 2.5 to 3 hours’ hike. Where the path forks below an open, grassy slope about half way up, take the left branch. Having arrived in Kakamauta, follow the main street through the village, passing the church and the mayor’s office on your left, and the football ground on your right, until you get to a T-junction. Turn left and leave the village on the dirt road leading south-west. After about 15 minutes, branch off to the left (south) onto a narrow path leading through high grass. There is no signpost and the beginning of the path is hidden in the grass 1 to 2 metres above the road. You will find it near a couple of dried-up trees on your left. Now follow the trail up to the crater of Mt. Sirung. It is an easy hike of another 1.5 to 2 hours. The first section will take you through eucalypt savanna. Then the vegetation diminishes owing to the rain of ash that fell on the upper slopes of the volcano during the eruptions of the past decades. Keep walking on the ridge above the canyon that leads to the crater rim. It is not dangerous in dry conditions. Finally, descend into the canyon and follow it upwards (the bottom of the canyon is almost even). Soon you will arrive at the huge crater. Inside the crater there is a large sulphurous crater lake and several active steam vents. It is possible to descend into the crater, but you are not allowed to do so all the year round. The locals say you must not enter the crater from June to September, because, if you did, Mt. Sirung could erupt and destroy the cashew harvest. Similarly, you must not go down into the crater from December to April, because at that time of the year it would endanger the rice harvest. So you can do it in October, November and May only. There is no trail to the summit of Mt. Sirung. In order to get to the summit (after visiting the crater), go back down through the canyon until you can climb the ridge on your left (to the west), and then work your way up on the tops of the ridges and in the ravines. It will take you another 2 to 3 hours. A route leading on to the summit of neighbouring Mt. Delaki and, from there, down to Puntaru, the village of the Pasir Tiga Warna (“the sands of three colours”), has yet to be explored. If you want to hire a guide in Kakamauta, the author recommends Pak Feri Tai. You’ll find him close to the T-junction in the centre of the village. You can also stay at his house if you want to spend a night in Kakamauta and start your hike early in the morning. * About 5 kilometres north-west of Mt. Sirung, you can observe how a new volcano is “born” – the Koralau: on a small, featureless hill, a gas eruption occurred for the first time in February 2011, burned the grass in the surroundings, and created a small crater of only about 10 metres in diameter. Getting there: From the west, take the ferry from Wairiang, Lembata, to Baranusa, Pantar. It is 45 minutes by ojek from Baranusa to Kakamauta. From the east, you may have to charter a boat from Alor to Tamakh where it is 1 hour by ojek to Kakamauta. Accommodation: Supposedly you can stay in the very basic village itself, but you may prefer to stay in Baranusa at Homestay Burhan. Permits: Not required, although you will need the cashew nut gods on your side! Nusa Tenggara Timur Kurang Tinggi. permalink. 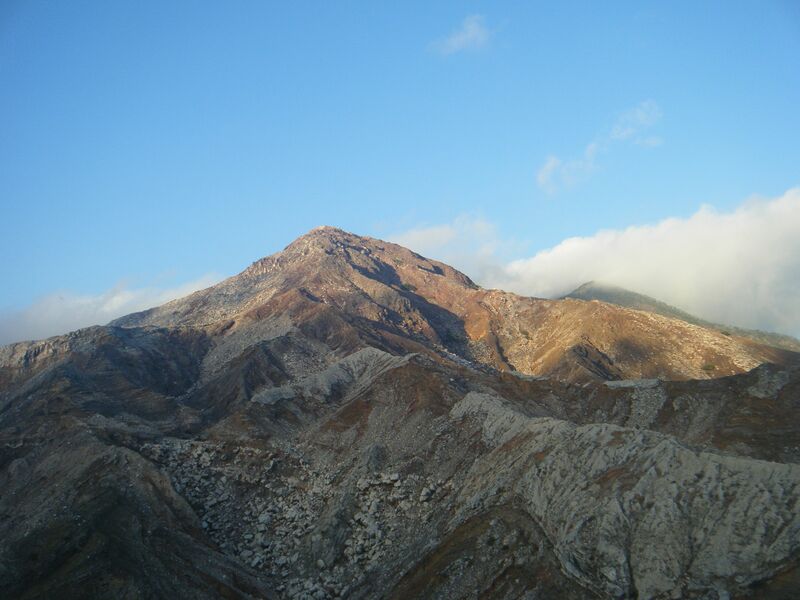 Mt Delaki is listed as S 8° 31′ 59”	E 124° 4′ 16” (https://goo.gl/maps/xvnrbwf13e92), which fits the 880m located 4km WSW of the highest peak of Sirung, according to GeoNames (http://www.geonames.org/advanced-search.html?q=delaki&country=ID&featureClass=T&continentCode=). Also, S 8° 33′ 1” E 124° 3′ 51” is “Tajung Delaki”, or Cape Delaki, the southwest tip of the island, just below that other peak. So I think Gunung Delaki is a different peak. That still leave the question of the correct name for the highest peak near the volcanic vent! Did this last week, a bit of a mixed bad really. Left from Baranusa, ojek to Mauta, where after meeking with headman they decided had to pay 100k for a “guide” and 100k to the village – non-negotiable. Ok start walking, about 1.5 hours in reach a clear split in trail where there is a rocky pass into the crater and another up to the rim. Here the guide demanded another 100k to go to either rim or crater. When I refused he started walking back! I caved and said ok, lets do the crater, go in and it is suitably impressive. When we come back out, he wants **another** 100k to hit rim and I tell him to forget it and we walk out. Is a relatively easy walk in and out, but very oridinary experience with the guide. I wish I had known you were in Alor/Pantar in July. I was there too. It seems that the people of Kakamauta are overdoing things now – the idea that visiting the volcano will damage the cashew harvest. 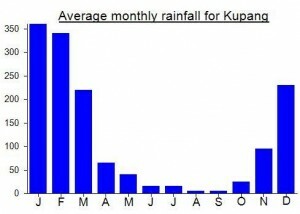 This may be due to the eruption of May 2012, although it was a small one. I last went up to the crater in August 2012 – via Beang and Darang. The mountain was still closed by order of the authorities. My guide was Pak Zabdi from Beang. He belongs to the tribe (suku) who owns the land, and he is an important person in his village. He said that no one would ever prevent him from setting foot on his own land and took me up to the crater (see photos and video). So I do recommend to take the route from Beang via Darang, or straight up from Beang (there is a path too), avoiding Kakamauta. Poor Feri Tai :)- I met him again in 2012 – he had come all the way to Koliabang to meet me. PS: Dan, I hope you’ll come to Alor again next July/August. I’ll be there, and I’ll try my best to make up for the rather unsatisfying experience you had this year. Hi Walter. Great to hear from you – I was a little worried you might have been sacrificed to the cashew gods! Next year would be great – I hope I can find the time for another NTT trip. Cheers for now, Dan. After coming down of Pura, we continued by boat towards Gunung Sirung on Pantar island. It took about 2 hours by slow boat to reach the tiny bay of Tamakh on the south coast. The trip, assuming your boatman does as ours did and hugs the coast the entire way, passes some lovely black rock formations and remote villages. Indeed, Pantar must be one of the most remote islands in Indonesia, with no proper roads, just dirt tracks, and clearly very little government money gets this far. Our arrival caused quite a commotion, with local chancers taking our bags and loading them onto motorbikes before we had even agreed to anything. Initially they wanted 75,000 for each ojek to Kakamauta, the village at the base of Sirung. Even given the recent fuel price increase, this is quite a sum for a one hour journey along a track. We managed to bargain them down to 65,000 each and off we went. The track leads steeply inland up the mountain and in places there are some lovely views of the Sirung mountain range. On our arrival in Kakamauta, we were surrounded by friendly but frazzled local chaps who had been chewing away on the betel nut all day. I mentioned climbing the mountain and looking for Feri Tai, the chap who had guided Walter up there the year before. Immediately they got very defensive and pointed to a nearby cashnew nut tree. “Our cashew nut harvest is not good, and if you climb this mountain, the harvest will fail and there will be many victims, not only in this village. We will not stop you, but there will be many victims”. Not exactly the sort of greeting we were hoping for. We decided to head to the house of the Kepala Desa to see if we could get any common sense out of anyone. Once again, a large crowd gathered, men asking for cigarettes, and nobody seemed to say anything of any sense. There was obviously a tension between the ancient belief of the link between climbing the volcano and having crop failure and the possibility of making some money by guiding us tourists up the mountain. As Walter wrote above, certain months of the year you are not allowed to descend into the crater, but it seems this has now been extended to climbing at all, regardless of whether you want to enter the crater itself. Perhaps there is a link between sulphur and poor harvests. But to warn people against climbing the volcano at all is really only going to have the effect of keeping Pantar in a medieval state with virtually zero tourist money coming in and an only precariously held state of basic morality. 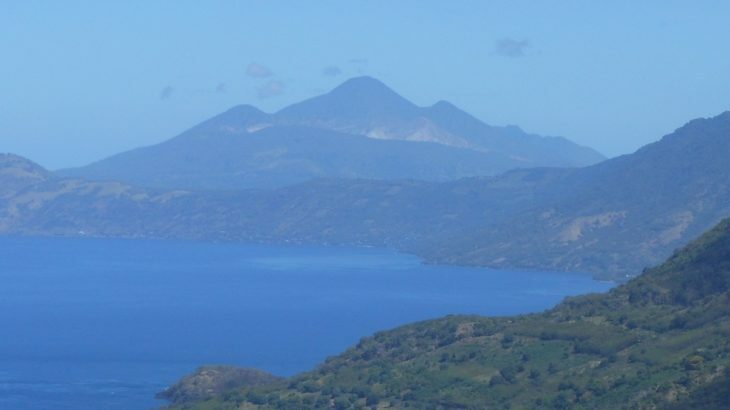 Given that there was no restaurant, shop and that we both hadn’t found a willing guide and had kind of caused a scene by even asking about the volcano led us to decide to abort and continue to the main port town/village of Baranusa, about 45 minutes and 20km away from Kakamauta. We asked the locals in Kakamauta about ojek prices to Baranusa, should we stay, and the first chancer suggested a whopping Rp200,000! Yes, this was the first part of the bargaining game but I find it offensive really. Take whatever you can, if the foreigners are stupid enough to pay it. No sense of ‘a fair price’. So we continued with our original ojek boys, who were being bullied a bit by the locals for not passing us on to them, and were glad to be out of there. Bad vibes. Who would want to be sacrificed to the gods of cashew nuts simply for climbing a volcano? Baranusa must be one of the tiniest port ‘towns’ in Indonesia. Luckily Homestay Burhan had basic rooms for Rp50,000. The public boat on to Wairiang on the east coast of Lembata leaves on Sunday (though these things change) so we had just missed it and without chartering our own vessel, we would be stuck waiting for another week! First things first, we had to pay the ojek boys for our journey. Nasty little swines they were, demanding Rp200,000 each and refusing to accept my very generous offer of Rp300,000 in total. But, as a foreigner in a very primitive place you have very few options. If we had agreed a price back in Kakamauta it would have been fine, but talk of 200,000 there and our lack of ability to clarify with our own ojek boys (as we were surrounded by villagers) meant we would have to discuss the final price in Baranusa itself. So, all this the same day as we climbed Pura. Not the best afternoon ever, in all honesty. Fascinating but ridiculous, especially as Sirung is supposed to be a brilliant volcano. Perhaps in another hundred years, the locals may start receiving some basic education, enough to help them realise that climbing a mountain and failure of cashew nut crops are not causally linked. Totally nuts!!! The electricity came on at 6pm and we got the helper at the homestay to go and find us some beers. Bizarre, microtonal synth strains began emanating from the nearby mosque and we had to watch our heads if we wanted to use the mandi, as there were a few wasps living in the doorway. After a coffee and a rice and noodles meal next door we fell asleep and dreamed of evil nut gods.